This is the type of report we’ve been waiting for. According to the Bureau of Labor Statistics, the U.S. economy added 211,000 jobs in November – 197,000 of which the private sector created. The unemployment rate stayed at 5%. 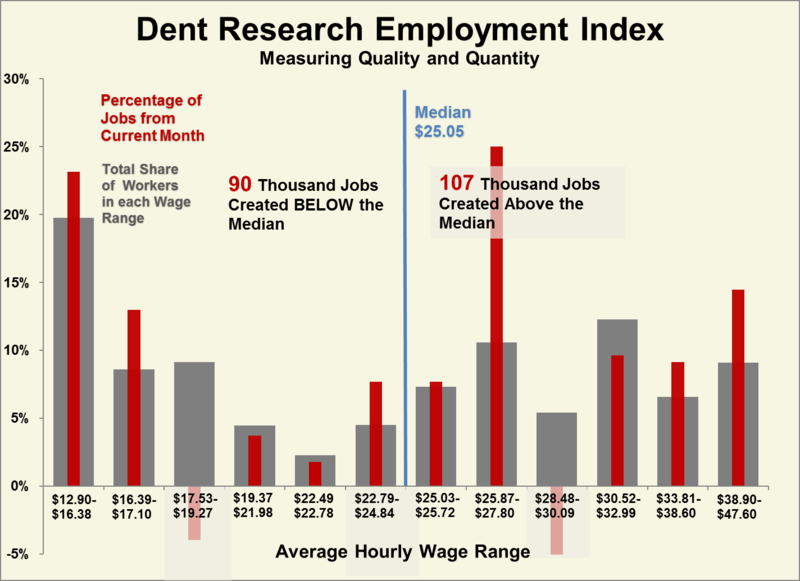 More importantly, Dent Research analyzes the quality of the jobs added. Upon closer inspection of the job additions for last month, we give November high marks. In a strong development, we find that a majority (54%) of the net 197,000 jobs added in the private sector were created above the measured median wage line. Specialty trade contractors did well in November, as did those in professional services. We also note that the long running U-shaped recovery in jobs – where most of the hires come from the lowest and highest-paying jobs, hollowing out middle-class workers – evaporated in November. In fact, 42% of the jobs added went to the middle third of jobs on the wage scale. Whether the November report is the beginning of a trend in the labor market or just a random blip, we can’t say.